This is the first part in a three-part series on Alberta’s CRL. Recently I decided to start learning more about Alberta’s Community Revitalization Levy (CRL), and I was initially struck by how little information was readily available. I searched and searched but didn’t find much. Maybe that’s because what we call the community revitalization levy here in Alberta is known as tax increment financing (TIF) elsewhere. It turns out that TIF has been available as a public financing method for more than 50 years! The State of California first used the approach in 1952, and now Arizona is the only state in the USA without some sort of TIF legislation. When a development or public project is carried out, there is often an increase in the value of surrounding real estate, and perhaps new investment (new or rehabilitated buildings, for example). This increased site value and investment sometimes generates increased tax revenues. The increased tax revenues are the “tax increment.” Tax Increment Financing dedicates tax increments within a certain defined district to finance debt issued to pay for the project. The idea is to use the “lift” generated by the increased tax revenues to pay for the debt that financed the project. In Alberta, this legislation is relatively new. Bill 28 received Royal Assent on May 10, 2005 and amended the Municipal Government Act (PDF) to include Division 4 under Section 381, which enables municipalities to create a community revitalization levy bylaw (which must be approved by the Lieutenant Governor in Council). Since that legislation came into effect, there have been three CRLs created in Alberta (as far as I can tell): Calgary’s Rivers District, the project for which Bill 28 was created, and the Belvedere (Fort Road) and Quarters redevelopment projects here in Edmonton. You can read more about all three projects in part two. The CRL only applies to a very specific area (the CRL boundary). The tax revenue that contributes to the CRL is split between the City and the Province. 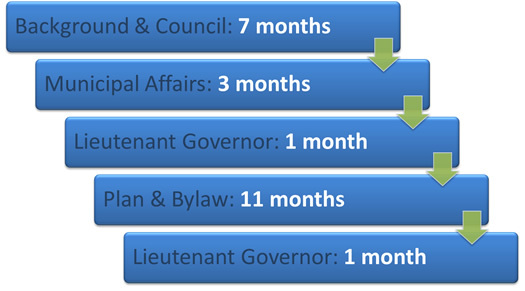 The maximum amount of time a CRL can exist is 20 years, starting in the year when the bylaw is approved by the Lieutenant Governor in Council. The Lieutenant Governor in Council can approve a CRL bylaw in whole or in part or with variations and subject to conditions. And don’t be mislead by the name “levy” – the CRL is a tax as defined in the MGA. It’s a funding mechanism, nothing more. From my read of the Municipal Government Act, there are no rules or restrictions on the type of area that a CRL can apply to. In theory a CRL works best in an area that is “blighted” but the legislation does not enforce this. This was the case in California as well, until it became clear that the legislation was being abused. What’s the potential impact of a CRL? I asked Rick Daviss, Manager of Corporate Properties at the City of Edmonton, to help me understand the CRL. He was very helpful and pointed me in the direction of some very useful information. Current use: 2.0 acre parcel of land improved with a 30,500 square foot warehouse. Proposed use: 2.0 acre parcel of land improved with a high rise residential condo development (proposed density of 265 units (RA9), FAR of 3.0, unit value assessed at $200/square foot). The mill rate is used to calculate the property tax, and you can think of it as the amount of tax required divided by the amount of tax available. So if the City needs $2 billion in taxes but only $1 billion can be generated based on the assessments, the mill rate is 2. The property tax is then calculated by multiplying the assessed value by the mill rate, and dividing by 1000. So to get $8,766 in our example above, $1,525,000 is multiplied by 5.7484 and then divided by 1000. Let’s look at the Before column first. The total tax assessment there was $14,284, and the two bottom rows are N/A because we don’t have a CRL in the before case. Both the City and School taxes are calculated the same way: assessed value multiplied by the mill rate divided by 1000. The province gets $5,518 and the City gets $8,766, all of which goes into what’s known as “general revenue”. Now let’s look at the After column. The total tax assessment there is $416,169. The City tax is calculated the same as before, but now that we have a much higher assessed value, we end up with $246,642 in increased tax revenue. All of this will go to the CRL. The School tax is broken into two, because only the incremental tax revenue will go toward the CRL. So the $5,518 is calculated the same as in the Before case, and this goes to the province. The provincial part of the CRL is calculated as follows: the increase in assessed value ($42,906,200) multiplied by the mill rate divided by 1000. That gives us the $155,243, all of which will go the CRL. So now you see why the CRL is such an attractive proposition: it looks like we have $401,885 in new tax that we can contribute to the CRL. And this could happen with all developments inside the CRL boundary. There are a number of caveats, however. The first is that the CRL amount will vary from year to year based on the assessment (which makes the economy and depreciation relevant) and on the school mill rate which also changes from year to year. The second is that the type of development is important – City owned properties are tax exempt, for instance. A third is that the City tax revenues as well as a portion of the School tax revenues are dedicated to the CRL, where they would otherwise have gone into general revenue. How is a CRL created? Administration conducts background research, identifies the potential boundary, comes up with preliminary revenue estimates, and prepares for and asks Council for approval to make a request to the Minister of Municipal Affairs. The Minister of Municipal Affairs considers the request and recommends an Order in Council for an establishment regulation. This step also includes some back and forth to establish the area and other parameters. The Lieutenant Governor in Council considers and approves the Order in Council for the area to be established. Administration conducts more research, holds public hearings, drafts the proposed bylaw, has it reviewed by all relevant departments as well as the province, and acquires Council approval of the bylaw. The Lieutenant Governor in Council approves the bylaw. After all that is done, the CRL can proceed. It makes sense to plan for the Lieutenant Governor in Council’s final approval as close to the start of construction as possible, in order to get the maximum possible time under the CRL legislation. What are the risks associated with a CRL? As others have pointed out, a CRL is not a risk-free proposition. There are a number of issues to consider. What if a project does not lead to an increase in property values and does not result in any new development? In this case, there would be no “lift” to pay down the debt of the project. Rick noted that a plan for this kind of scenario needs to be in place before the province will approve a CRL. It can be as simple as the City swallowing the cost of the project, as long as it can specify how it will be paid for. Another option is for a third party to backstop the plan. Another issue is the potential shift in taxes. Will the project really result in new development – development that would not have occurred in the city otherwise – or is it merely a shift in development, from areas outside the CRL to the area inside the CRL boundary? How would you know, one way or the other? A related issue is the decrease in general tax revenue. If the property tax inside the CRL boundary is no longer going into general revenue, what does that mean for the services the City provides? In the worst case, you can imagine the entire City being covered in various CRL projects. That would result in zero general tax revenue and thus no way for the City to pay for the services it provides to citizens. What is the impact of one or two CRL projects? That’s less clear. Same goes for the school taxes. A common concern for many people is that they don’t want their school taxes going toward the CRL instead of schools. Of course, in reality the province doesn’t come up with education programs based on the amount of school tax it receives – tax revenue does go into the Alberta School Foundation Fund, but that money is combined with whatever amount of general revenues the province deems appropriate. Can a CRL really work? The project the CRL would be funding is a good thing, and is worth the risk. There’s a sound expectation that development will occur as a result. If you think the project is worth the risk, and you’re confident that development will occur as a result of taking that risk, then a CRL can be a good funding source. Rick highlighted the Belvedere (Fort Road) project as meeting this basic criteria: it’s an area that needs to be redeveloped and it’s unlikely that anything would happen without some initiative by the City, plus there’s a good chance that other development will occur now as a result of the City going in and cleaning things up. If you’ve made it this far, you should now have a better understanding of how Alberta’s Community Revitalization Levy came to be, how it works, and what the potential impacts and pitfalls of the legislation are. In the next part of this series, we’ll look at Alberta’s three current CRL projects in more detail.